Right from the moment that he stepped aboard an uncompetitive Lotus 102B in Phoenix in March 1991, it was clear that Mika Hakkinen possessed the sort of talent to progress to the very top. The blond Finn with the cherubic face of a choirboy was a graduate of karting and the Opel Lotus Euroseries, and only the previous year had clinched the British F3 Championship after a tough fight with fellow countryman Mika Salo. Hakkinen matured further in 1992, and enjoyed a string of promising results in the new Lotus 107. By season-end he had been snapped up by Ron Dennis at McLaren. But 1993 would be an odd year, for McLaren already had Ayrton Senna and American Indycar champion Michael Andretti on its books, and therefore there was no room for the Finn actually to race. Instead he had to content himself with testing duties until Andretti, who was finding F1 a tough nut to crack, finally returned to the United States after the Italian GP in September. Free at last, Hakkinen celebrated by giving Senna a wake-up call in Portugal and out qualifying the great Brazilian. Senna was demotivated by having to drive what he regarded as an uncompetitive McLaren that was no match for the Williams-Renaults, and barely as quick as the Benetton-Ford of new upstart Michael Schumacher. Hakkinen never beat Senna again, but his performance was an indication of his real potential. He spent 1994 and 1995 honing it, taking over as team leader when Senna left for Williams at the end of 1993. But these were lean years for the McLaren team as Peugeot replaced Ford, and was in turn replaced by Mercedes-Benz. He calmed down after a series of incidents in 1994, and scored his best-ever result in the Japanese GP at Suzuka in 1995. One race later he nearly died after crashing heavily during practice for the last Australian GP to be held in Adelaide. A tire failure sent him into a concrete wall, and only an emergency tracheotomy, performed by the side of the track, saved his life. What happened next was quite remarkable. Hakkinen recuperated during the winter, and came back as if nothing had happened. Only those in the center of the team appreciated the mental demons that he needed to slay during the course of the season that followed. But Hakkinen kept pushing ahead, and the more he progressed, the further the demons receded. By 1997 McLaren and Mercedes had developed a car capable of winning, as Coulthard proved by taking the Australian season opener. 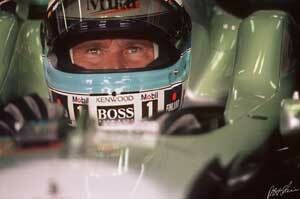 Hakkinen had to wait a while longer, and when victory finally came no man had waited longer. After the celebrated incident between Schumacher and Villeneuve at Jerez in 1997, which settled the outcome of that year's title, Hakkinen swept through to take his first victory. Since that historic moment he has never looked back. He won his first World Championship in style in 1998, winning eight of the 16 races, but though 1999 was a far tougher year, in which he twice made mistakes in Italy which cost him race wins, he came back strongly when it mattered to retain his crown in the final race. The man who came back from the dead had established himself as the only man capable of challenging Michael Schumacher. In 2000 Ferrari was stronger than ever and although Hakkinen won in Spain, France, Austria, Hungary and Belgium the World title went to Schumacher. At the start of the 2001 season Hakkinen had a big accident at the Australian GP and it clearly had aa major effect on his thinking. He decided that he would "take a year off" and then won the British and United States Grands Prix to show that he had lost none of his pace. It was never very likely that he would return to F1 as McLaren no longer had a seat for him and at Monaco in 2002 he announced that he was retiring. In 2003 and 2004 Hakkinen sat on the sidelines but for 2005 he signed to drive for Mercedes-Benz in DTM. Hakkinen continued competing in DTM until the end of 2007 when he retired from main stream racing. Since then he has been involved in driver management as well as being a spokesperson for Mercedes and for Johnnie Walker.